Start with these two, which lay the foundation. If you were to only read two books about UU, and you needed them to be fairly short, these are the two I'd recommend. 1. David Bumbaugh, Unitarian Universalism: A Narrative History (Meadville-Lombard, 2001). 226pp. A short, easy-to-read overview of our story. The only flaw is that Bumbaugh neglects to mention the Iowa Sisterhood, a cadre of women Unitarian ministers in the late 1800s who led churches out on the prairie frontier. This gap will be filled when you get to book #12 (below). Otherwise, this is a breezy and easily digestible book for beginning to get a handle on what UU is all about. 2. 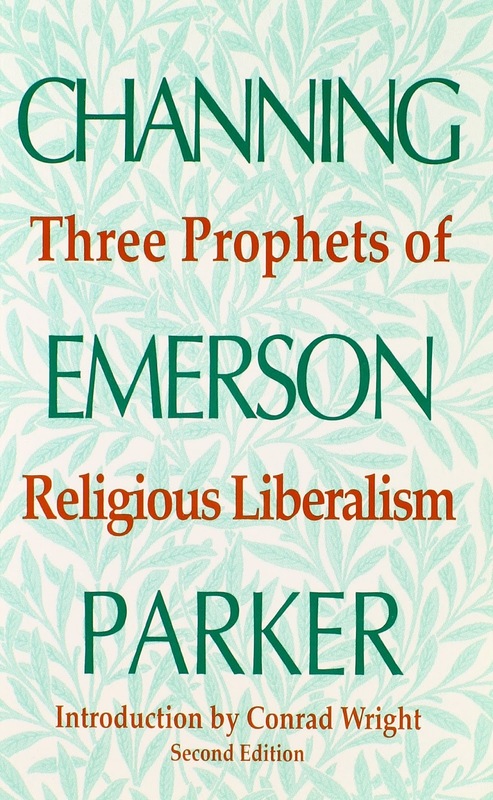 Conrad Wright, Three Prophets of Religious Liberalism: Channing, Emerson, Parker (Skinner House, 1994). 160pp. 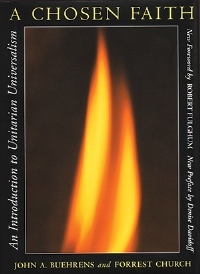 Includes the three absolutely essential statements from which everything else in Unitarian history grew: William Ellery Channing, “Unitarian Christianity” (1819), Ralph Waldo Emerson, “Divinity School Address” (1838), and Theodor Parker, “The Transient and the Permanent in Christianity” (1841). Conrad Wright’s extensive introduction is most helpful. With the basics of our history under your belt, turn to our theology: our spiritual teachings and the grounding of our values. 3. Forrest Church and John A. Buehrens, A Chosen Faith: An Introduction to Unitarian Universalism (Beacon, 1994). 240pp. The 240 pages are small. This interesting book is organized around the six sources of our UU living tradition, with one essay by Church and one by Buehrens on each of our sources. Buehrens and Church reference our history by discussing how our historical background is playing out in our churches today. A marvelous and important way of getting the grasp on what we are all about. At this stage, the grounding of your UU faith will be deepening, enriched by the heritage and thought of this tradition. 4. Edward A. Frost, Ed. 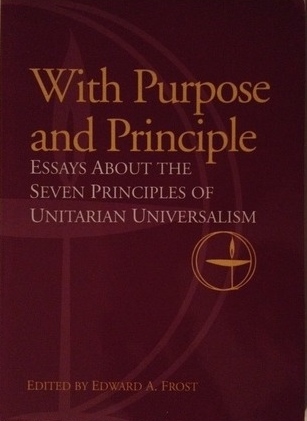 With Purpose and Principle: Essays About the Seven Principles of Unitarian Universalism (Skinner House, 1998). 128pp. 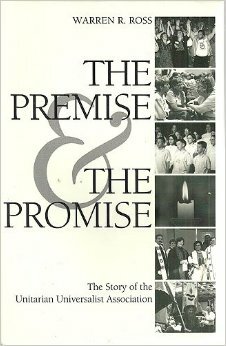 This little book offers a short history the seven UU Principles (adopted in 1985) followed by essays from John Buehrens, Marilyn Sewell, Earl Holt, and Barbara Merritt, and others exploring the meaning and significance of each principle. Let’s now really focus on the Universalism side. The history here is rich and in itself offers us resources for living our faith today. Here, and in the next section on Unitarianism, the books offer diverse perspectives that will strengthen and expand the grasp on our story that you began to get from Bumbaugh (above). This section also includes exploration of Universalism's meaning today. 5. 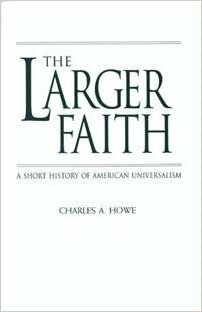 Charles A. Howe, The Larger Faith: A Short History of American Universalism (Skinner House, 1993). 168pp. Howe condenses Russell Miller’s massive two-volume study, The Larger Hope, vol 1: The First Century of the Universalist Church in America, 1770-1870 and The Larger Hope, vol. 2: The Second Century of the Universalist Church in America, 1870-1970. 6. George Hunston Williams, American Universalism, 4th ed. (Skinner House, 2002). 136pp. This began as Williams's keynote address to the 1970 UUA General Assembly, expanded into this classic study of Universalist theological positions. Examines the richness of American Universalism and its many expressions in American life and thought. Williams considers the social reform efforts of Horace Greeley and Quillen Shinn, the ordination of women, the temperance movement and more. 7. Ernest Cassara, Editor. 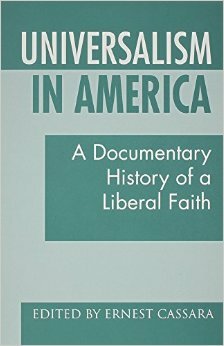 Universalism in America: A Documentary History of a Liberal Faith(Skinner House, 1997). 304pp. Selected writings from some of the most influential persons in Universalism, 1741 to 1961, plus incisive commentaries. Sketches the fascinating course of Universalism, stressing trends in thought and in American society. 8. Forrest Church, The Cathedral of the World: A Universalist Theology (Beacon, 2010). 216pp. The last book from UU minister Forrest Church, who died of cancer in 2009. This collection of sermons, essays and speeches lays out a framework for a 21st-century universalist faith. Contrary to popular opinion, he says, universalism is the most morally rigorous of theologies because of its call to respect and even embrace otherness, rather than merely to tolerate or, even worse, dismiss it. We delve more deeply into our European roots and our American development. We’ll then examine two important chapters in Unitarian history: the first wave of women in our ministry, and the emergence of the Humanist movement. 9. 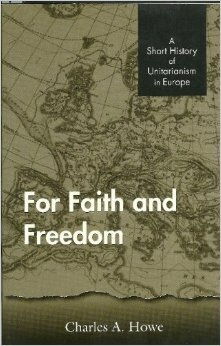 Charles A. Howe, For Faith and Freedom: A Short History of Unitarianism in Europe (Skinner House, 1997). 232pp. Howe condenses and makes more readable Earl Morse Wilbur’s magisterial (though some have said "ponderous") two-volume history of Unitarianism in Europe. 10. Conrad Wright, Ed. A Stream of Light: A Short History of American Unitarianism (Skinner House, 2001). 192pp. Five authors, writing one chapter each, provide a survey of Unitarian thought in the US from 1805 to 1961. 11. Cynthia Grant Tucker, Prophetic Sisterhood: Liberal Women Ministers of the Frontier, 1880-1930 (Authors Choice, 1990, 2000). 312pp. 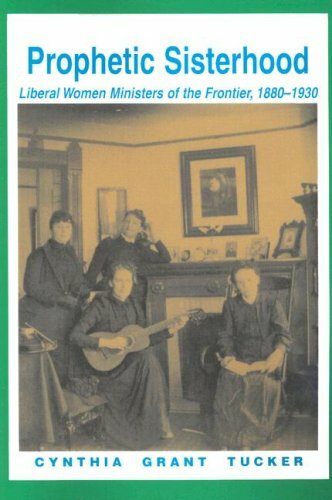 Tucker, an English Professor, has written a powerful history of the women of the “Iowa Sisterhood”: Unitarian ministers in the late 1800s on the prairie frontier who broke through boundaries of gender and brought to Unitarianism a more family-centered and relational style of congregational life. 12. 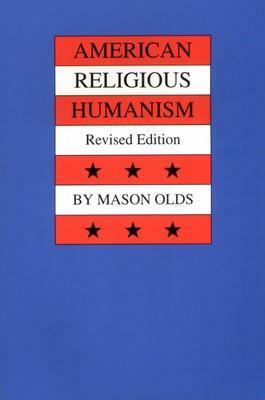 Mason Olds, American Religious Humanism (Religious Humanists, 1996). 237pp. In the 1920s and 1930s, influential Unitarian ministers John Dietrich, Curtis Reese, and others turned Unitarianism into a home for humanism. This is the story of how that happened. 13. Warren R. Ross, The Premise and the Promise (Skinner House, 2001), 228pp. 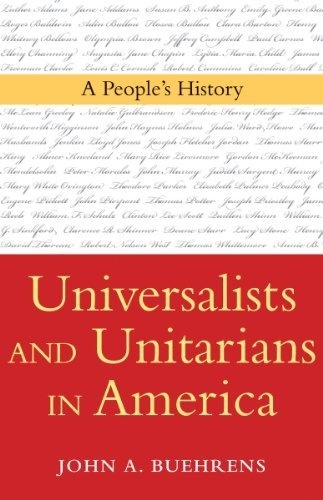 Warren Ross (a member of Community Unitarian Universalist Congregation at White Plains for many years) has written the definitive history of the first 40 years of the UUA (1961 - 2001), after the AUA (American Unitarian Association) and UCA (Universalist Church in America) consolidated in 1961. With material from more than 60 interviews, he tells a compelling institutional tale of two like-minded but separate religious bodies electing to unite and move into the future together. 14. George Kimmel Beach, Ed. The Essential James Luther Adams: Selected Essays and Addresses (Skinner House, 1997), 240pp. James Luther Adams (1901 – 1996) was the most important Unitarian theologian of the 20th Century. This little book collects essays spanning Adams’ long career. 15. 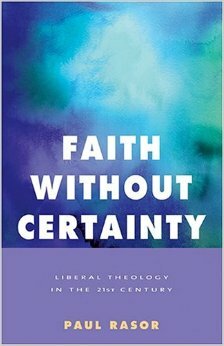 Paul Rasor, Faith Without Certainty: Liberal Theology in the 21st Century (Skinner House, 2005). 256pp. Paul Rasor, a UU minister, further develops the tradition of James Luther Adams. His clear-eyed yet hopeful analysis explores the dynamic tensions of liberal theology, committed to individual freedom on the one hand and community on the other. 16. 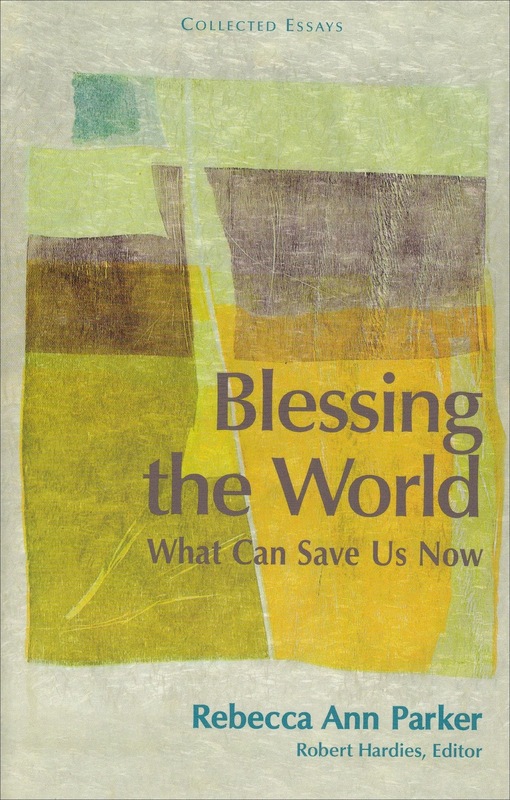 Rebecca Ann Parker, Blessing the World: What Can Save Us Now (Skinner House, 2006). 169pp. Rebecca Parker, president and professor of theology at the UU seminary, Starr King School for the Ministry, is moving, original, and heartfelt in the eloquence with which she draws upon and recasts theological resources that direct us away from violence and toward the forces that repair broken life. 18. 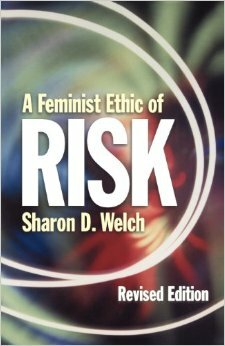 Sharon Welch, A Feminist Ethic of Risk (Augsberg Fortress, 1989). 208 pp. Sharon Welch, Provost and Professor of Religion and Society at the Unitarian Universalist seminary, Meadville Lombard Theological School, proposes a new model for ethics and new life orientation for social justice. In this book, Welch directly addresses American and European "middle-class despair" over issues and challenges seemingly too large to tackle, such as environmental destruction or racism. Her ethic uproots classical assumptions and opens up the possibility of a strong religious vision or "theology of resistance and hope." 19. John Gibb Millspaugh, Ed. 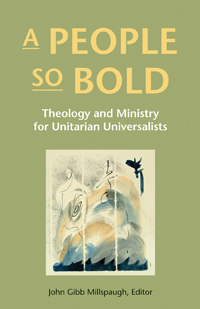 A People So Bold: Theology and Ministry for Unitarian Universalists (Skinner House, 2009). Twenty-two prominent ministers, lay leaders and theologians discuss the future of Unitarian Universalist social justice work. Their thoughts and hopes for the future are captured in this inspiring collection of essays. Grounding this mission in an historical context, these voices address questions like: How does our faith hold brokenness, injustice and suffering? 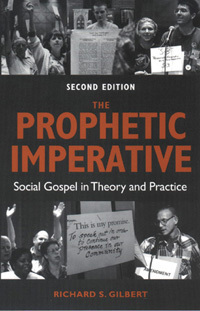 and How do we develop a prophetic voice? This self-guided study course concludes with this new book which will reward the work of your reading up to this point, and offer vital and important additional perspectives on who we are, how we got this way, and where we go from here. 20. John A. Buehrens, Universalists and Unitarians in America: A People’s History (Skinner House, 2011). John Buehrens begins his new history with the observation that "Religion is people." While previous accounts of Universalism and Unitarianism have focused on a few great men, this history shines a light on the contributions of many, both exalted and obscure, whose stories illustrate the texture of lived religion. Both faiths are chronicled in parallel development through their consolidation in 1961. Buehrens weaves a historical tapestry rich in color and meaning. Epilogue: In the light of all you’ve studied, come full circle and now re-read the Channing, Emerson, and Parker addresses in book #1, above. Much indeed has grown from those roots!